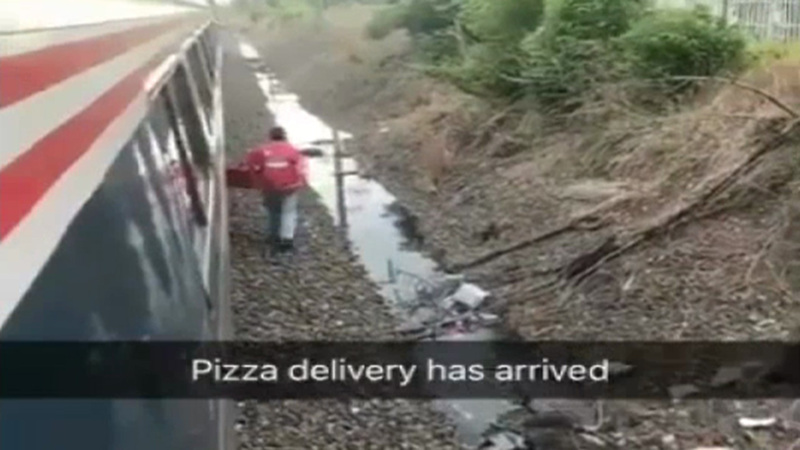 WILMINGTON, Delaware -- A pizza delivery man in Delaware got an order from an unusual address: a stalled Amtrak train from New York on its way to Washington. Passenger Mitchell Katz posted a video of delivery man Jim Leary walking up to the train Sunday evening as it sat on the tracks. People on board were getting restless after being left without access to food or water during the long delay and eventually some passengers came up with the idea of ordering a pizza, Katz said. Leary, a driver for Dom's Pizza in Newport, Delaware, tells The Associated Press he cut through a backyard, navigated a steep embankment and jumped over a water-filled ditch all while balancing the two pies in order to make the delivery. Leary was rewarded with a cheering crowd of passengers and a total of $32 in tips for his effort. Leary's pizza delivery career has brought him to addresses in 32 counties across 18 states, but he said the broken down train is one of the strangest. "I do whatever it takes," he said. Amtrak said on Twitter that a mechanical issue was to blame for the delay. Eventually, another train was brought in to take the passengers to Washington, Katz said. Amtrak's website shows the passengers arrived more than three hours late. Amtrak didn't immediately respond to a request for comment Monday.